"The Hand of God Shall Strike Again"
Horatius was born a gardener aboard the ship, a generational colony vessel seeking new life among the stars. But he has always wanted to be a historian, one who remembers stories of life on the ship before it was struck by an asteroid several hundred years before. Discouraged by his father, who claims that stories cannot feed a hungry stomach, Horatius nearly gives up his dream until he discovers that stories may be the only way for the ship's passengers to survive. The Bridge has not been tagged yet. Help others find The Bridge by tagging it! 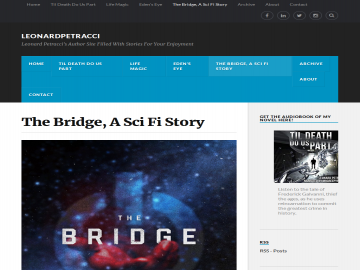 The Bridge has not been reviewed yet. The Bridge has not been recommended yet.